We look forward to experiencing a transformative vacation with you in the lush forests of British Columbia. You can fly into the international airport located in the city of Spokane in Northern Washington State, or into the smaller airport of Castlegar, British Columbia. From there you will ride a private Mountain Trek shuttle to the lodge. Flights are available through the following airlines: Alaska, American, Delta, Southwest and United. If flying in on the Saturday start of your program, please arrange to land at the airport no later than 1:00pm in order to allow our shuttle to depart for the lodge at 1:30pm. Your return flight departing Spokane should be no earlier than 1:00pm. Please note: A passport is required to cross the border. A driver will meet you on the sidewalk outside the baggage claim area for terminals A & B at 1:15pm PST. The driver has your name and will be waiting curb-side with a Mountain Trek sign. In the event you have a travel delay, please call the Mountain Trek office at 1-800-661-5161 or 1-250-229-5636 or email the shuttle company at info@kootenayshuttle.com. The drive will take approximately 4.5 hours with the border crossing. Flights are available throughout the day on Air Canada via Vancouver or Calgary. Please arrange to land no later than 3:00pm. A complimentary shuttle will take you to our lodge via the beautiful town of Nelson, which you can explore if you have the time. Your return flight can be booked for any time of the day, as the shuttle will match the flight times. Upon arrival at the small Castlegar airport, please look for the Queen City Shuttle parked directly out front and inform the driver (who will have your name) that you have arrived. Then you can collect your bags and/or use the washroom before the journey. You will be taken to the Best Western Hotel on Baker Street in Nelson (a half-way point) and, depending on what time you’ve arrived, you’ll then have a chance to explore the beautiful town of Nelson. You can store your bags with the front desk. At 5:00pm you will again be picked up by The Queen City Shuttle at the Best Western Hotel for the drive to the lodge. (Timing could vary depending on traffic delays.) Please be outside the Best Western Hotel at 5:00pm for the Queen City shuttle transport to our Lodge. Please note: due to Castlegar’s small size and location in the mountains, it is subject to more frequent delays and cancellations. Bring layers, leave fancy attire at home—this is your time to recharge in comfortable clothing. Daily laundry services will be available, and we provide shampoo and conditioner, soap, a hairdryer, bathrobe, backpack and hiking poles. We also gift you a 3L water bladder. 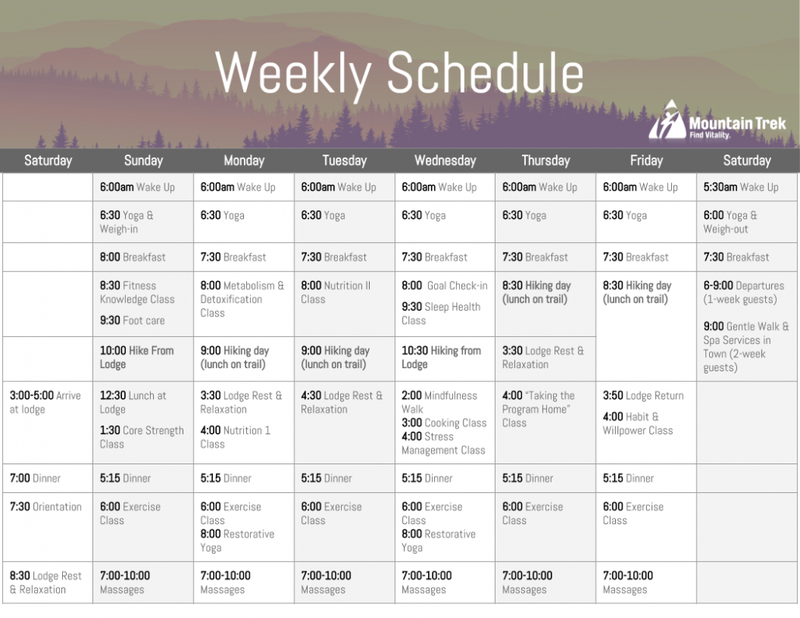 For the week or two you are at Mountain Trek, you will no have sugar, alcohol, or caffeine. While the sugar and alcohol might be obvious, cutting caffeine might be perplexing. Caffeine stimulates the adrenal glands to produce the stress hormones cortisol and epinephrine. Higher and prolonged levels of cortisol in the bloodstream have been shown to have a negative effect on raising the metabolism, altering blood sugars and blood pressure and decreasing muscle tissue and bone density. It has also been shown to increase the deposit of belly fat for a significant percentage of the population. We offer substitutes at the retreat that will satiate your coffee needs. It is required that all guests purchase trip cancellation insurance, and travel medical insurance (if coming from outside Canada). The Mountain Trek program is non-refundable. Please visit your local travel agent to do so, or purchase insurance online. For answers to your questions, call 1.800.661.5161, or email guestcare@mountaintrek.com.